Xmas flyer design Rotary club. 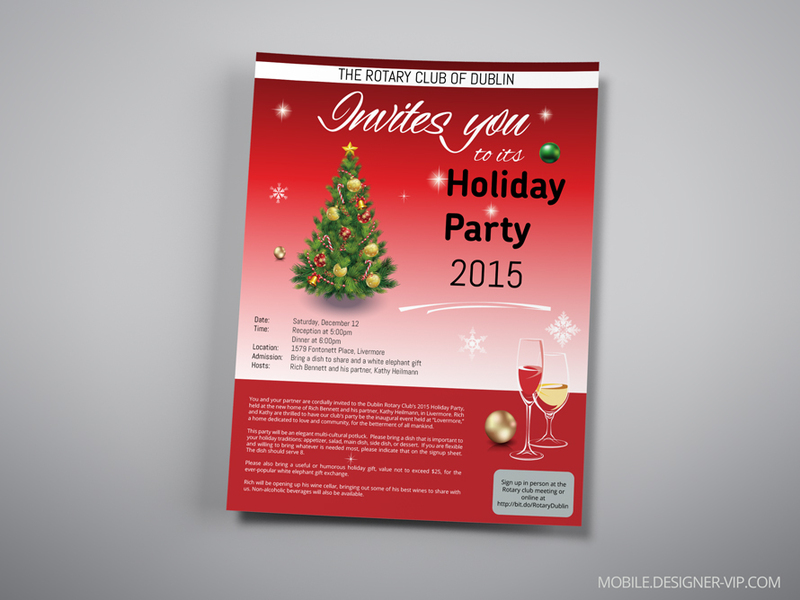 Create a holiday party invitation flyer for The Rotary club of Dublin. Page size: 8.5 x 11 inches. Document output: PDF, minimum 200 DPI for non-vector artwork. Artwork type: vector or raster. I’m looking forward to what you come up with! Please make the link clickable on the PDF document. Is the link live and clickable? I had to review this in my phone so I couldn’t check. I will be distributing it in both printed and online format. Can you use a Christmas tree instead of a snowman? We don’t get snow here in California so if feels out of place. Also, it would be good to have more green in addition to the red so a Christmas tree would solve both problems. I was just thinking that if it fits, it would be nice to incorporate images of wine bottles and/or wine glasses in the flyer, since the host is into wine and will be serving wines from his private collection. Of course it’s still a holiday (Christmas but not Christian) party so it should not be primarily wine-themed. Created high quality Xmas flyer in vector format (Ai, eps, pdf) for company with turn round – ~1 day. If you need a Xmas flyer designed for your company our studio can help.